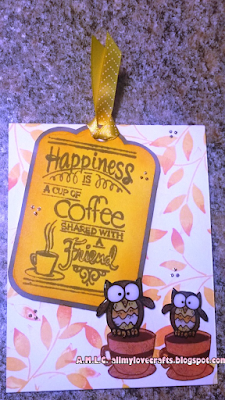 All My Love Crafts: Melonheadz Challenge and Day 4 of the Fall Coffee Lovers Bloghop! 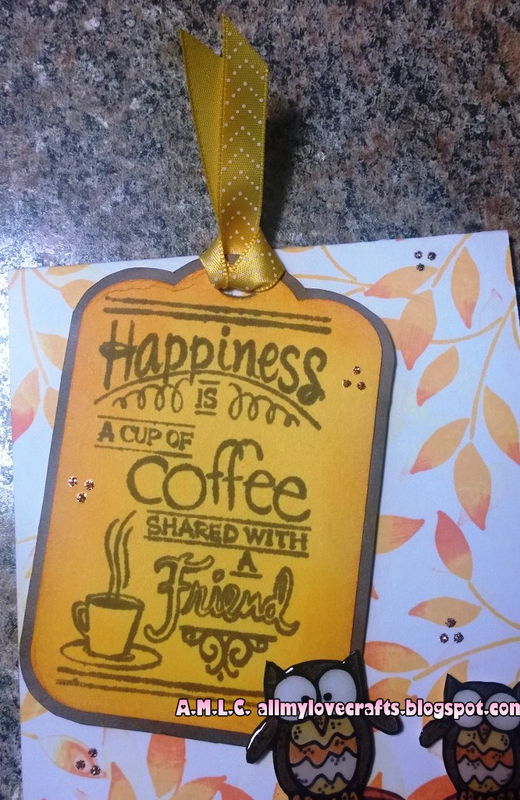 Melonheadz Challenge and Day 4 of the Fall Coffee Lovers Bloghop! It's Day 4 of the Fall Coffee Lovers Bloghop as well as the start to Melonheadz new challenge: Fall is in the Air! 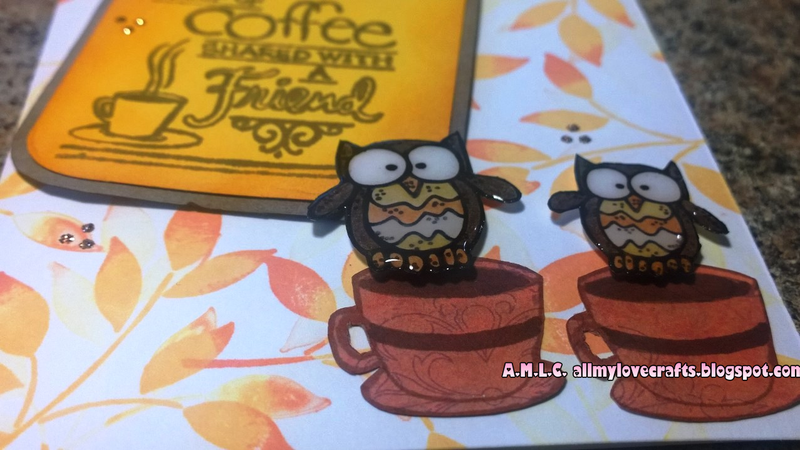 I fell in love with this adorable little owl in their Halloween Stuff digital image bundle and chose to use candy corn colors. Really enjoy the rich color of these Hero Arts Mini Ink Cubes and used Orange Soda, Butter Bar and Cup-O-Joe for today's card. I love the thickness of Recollections 110lb card stock from Michael's craft store and these Hero Arts Inks absorbed into the paper beautifully! 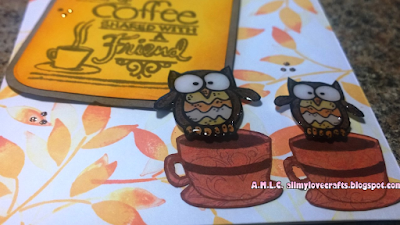 First and second generation stamping was used for the background with an older stamp by Stampin Up. 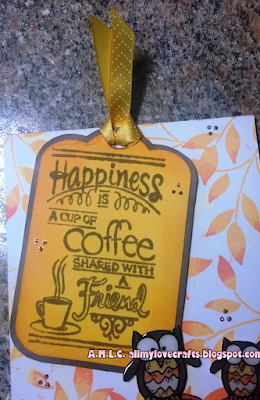 The yellow tag was also distressed using Spiced Marmalade ink by Tim Holtz. Foam tape was used to pop up the tag as well as the 2 little owls. 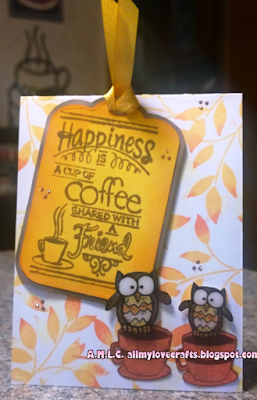 To finish this card, I used Copper Stickles and covered both owls in Glossy Accents. Link up HERE by October 11th to join Melonheadz Fall Challenge! Enjoy!